The US East Coast is preparing for Hurricane Florence. It may be the strongest storm to hit the region in decades. The governor of South Carolina has ordered the evacuation of its entire coastline. Meanwhile North Carolina and Virginia have declared states of emergency. Florence is now a category four storm with 130mph (195km/h) winds. A large-scale evacuation is underway as the East Coast braces for Hurricane Florence in what may be the strongest storm to hit the region in decades. South Carolina's governor ordered the evacuation of its entire coastline, involving over a million people, while North Carolina and Virginia have declared states of emergency. It's expected to make landfall by Thursday. 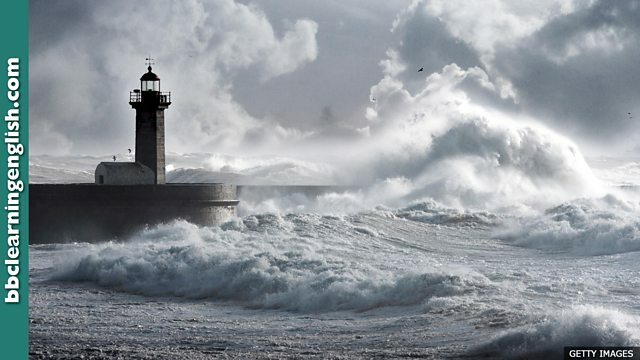 • The storms often menace the coastal region from August to October. • Why must you always be a menace to your sister? Please behave nicely. • The new wave machine began churning the water of the indoor swimming pool. • Kim drives so fast! After being in the car with her, my stomach was churning. • The boy went quietly to the village. He knew there was a lion lurking nearby. • I love you, but I'm not going to marry you, Ismael. Stop lurking outside my door! We need an adjective here. Neil lives next door to a ______ dog. It tries to attack him every day. You need a word which means 'moving violently (especially a liquid)'. My stomach was ______ ahead of the exam. I was so nervous! Danger ______ in the jungle. Animals are waiting to attack!